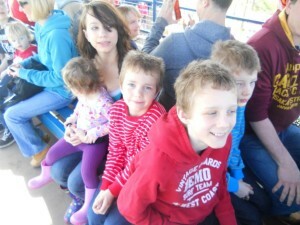 We paid £20 admission for our family (two adults, five children including one under 2) to visit. There is a large field next to the lambing sheds which is used as the car park for the duration of the lambing weekends, and after you have visited the newborn lambs and fed the deer in the field behind it there are tractors and trailers that taxi the visitors down to the main ‘home farm’. There are hand washing facilities outside all of the barns to allow you wash your hands after you have seen the lambs, and you’re also given sterile wipes when you arrive (in addition to a guide to the farm, and a sheet so that you can enter the farm quiz competition). On the main farm there is plenty to do and see. If you’re there for lunch, there are food vendors selling burgers, chips & drinks and the like, and a large fenced grassy picnic area with a handful of picnic tables. The chips were £2.50 a portion, and steak rolls were £4.50 each. Having eaten on the way there, we bought some drinks & sat with my sister and her family while they had their lunch. There were also several stalls offering locally made & sourced produce including sweets and honey, and a farm shop which sold ‘Lackham meat’. 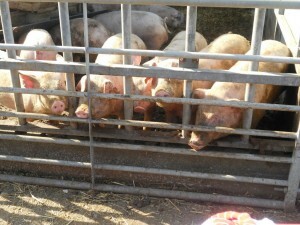 After lunch we ventured around the farm and visited the animals. There were of course lots of new babies to meet, and the children loved seeing all the new baby lambs, piglets and calves. A & H were also able to groom a donkey & a little Shetland pony who were brought out to meet everyone. In the stables there were guinea pigs, rabbits and even Meerkats, who were particularly keen to come and greet everyone. 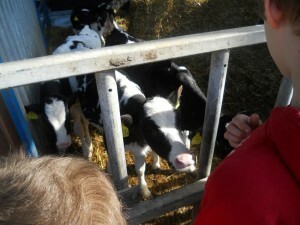 The calves were also very friendly & rather curious, 2 of my children got a great big lick after not moving away quick enough! We arrived at the milking sheds just in time to see the milking so after we visited the ladies-in-waiting (cows preparing to calve! 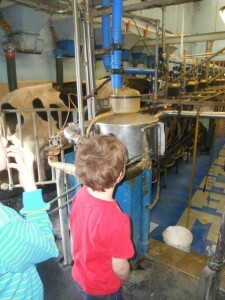 ), the kids were able to see the dairy herd coming in to be milked, which they were completely fascinated by. After watching the milking, we had a walk round to see the “pork & bacon” pigs who were busy truffling around in their pens thoroughly enjoying the sunshine & wallowing in their own poop, who eagerly came up to say hello to anyone who happened to be passing by. We wandered back around to the main area, and stopped off and let the children have a go on the bouncy castle which was £1.50 for five minutes. There was also a chair-o-plane ride and another small fairground ride suitable for smaller ones, which were both also priced at £1.50 a turn. In addition, there’s a land train called ‘Chuffy’ that offers rides around the farm for £1 each. By late afternoon, we had sleepy toddlers nodding off on their dads shoulders so we had another short tractor ride back along to the car park and then made our way home. We had a really wonderful day and all of the kids thoroughly enjoyed it, even my bigger kids who were 13.5 and 11 at the time said they enjoyed it and want to visit again this year. At £20 for the seven of us to visit, it was great value for money as well as educational, with plenty to keep the kids entertained and for us to look at & enjoy. The tractor ride was the absolute icing on the cake for H, he was happier than the pigs in muck getting 2 tractor rides in one day! Pull on your wellington boots and go and spend some time down on the farm! It is worth bearing in mind that they do not recommend that pregnant women visit the lambs. 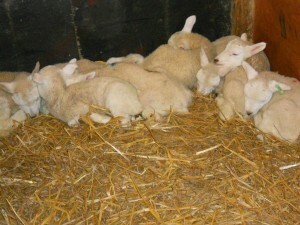 Lackham Farm lambing weekends for 2013 are 9th/10th & 16th/17th March from 10am-5pm (last admission at 4pm). 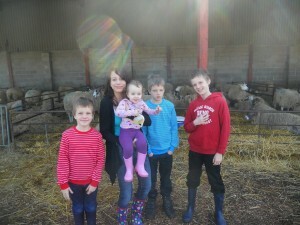 Please see http://www.lackhamfarm.co.uk/lambing/ for more details. Looks like a lovely place to visit and not too late! I hope so too. And thank you for contributing. It looks like a lovely place, and a fantastic find!